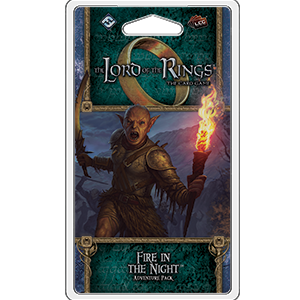 Fire in the Night is the second Adventure Pack in the Ered Mithrin cycle for The Lord of the Rings: The Card Game. You thought you could rest. After roaming far across Wilderland and slaying two powerful Dragon spawn, you have arrived at the Woodman settlement of Hrogar’s Hill where you hope to gain some much needed respite from the dangers that have plagued you throughout the Ered Mithrin cycle. But it is not meant to be. Shortly after starting a meal, you are roused by the sound of alarm. Outside, a terrifying red-orange glow has cut a swath through the black night. The Dragons’ mother has arrived to exact her revenge. The sixty cards contained in Fire in the Night see you joining the people of Hrogar's Hill against an assault from the Dragon Dagnir the Terrible. Aiding you in this effort are several new player cards, including a new Silvan hero and several new allies. Only by banding together can you face down this menace and keep Hrogar's Hill from becoming a smoldering ruin. This is not a stand-alone deck. A copy of The Lord of the Rings: The Core Set and The Wilds of Rhovanion deluxe expansion are required to play.